Charleston produces more Bank Robbers than anywhere else in the world! Where the hell has Ben Affleck been? Usually when this question is asked the answer is how did the promising actor/ actress manage to let things slip away? Affleck won an Oscar with Matt Damon for penning “Good Will Hunting”, but Affleck watched as his friend’s stardom rose, Affleck’s stayed motionless, because of poor choices in acting roles. “Gone Baby Gone” Afflecks debut as a Director was a promising flick, but everyone wanted to know was it just a onetime thing? “The Town” which Affleck also Directs, co-writes, and stars in, gives us the answer to where Ben Alleck has been. 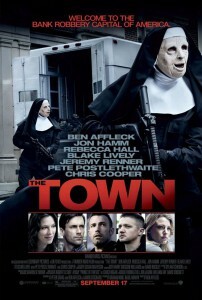 “The Town” is of course set in Boston (Affleck’s home town), on the streets of Charleston, which we learn produces more bank robbers than anywhere else in the world. The people of Charleston look out for each other, they are tight-lipped about everything, the mere thought of ratting out a friend is unthinkable, no matter what he or she has done. Doug MacRay(Affleck) is the brains of the bank robbing crew that pulls off elaborate, well planned bank jobs, while dressed in various Halloween outfits. During the first job we see them do, they take Claire (Rebecca Hall), the bank manager hostage. They do let her go without a scratch, but realize the she is also from Charleston. They begin to wonder dose she know them? What should be done with her? A trigger- happy friend of Doug Jem(Jeremy Renner) wants to kill her and solve the problem as quick as they can. Doug on the other hand tells them he would look into it, see if she knows anything. This turns into Doug dating Claire and falling in love with her. All the while we have FBI agent Adam Frawly(Jon Hamm) is gathering evidence but is having a hard time of it because of Charleston’s Code of silence. He knows who is robbing the banks, he just needs to get enough evidence to put them behind bars. This turns into a cat-and mouse game, one that we are familiar with from a number of films, which means that for this film to succeed Affleck had to be spot on in his performance and execution. The film is Dependant on Affleck his performance and directing. He comes through on both fronts. Renner and Hamm play regular characters, but their performance elevate their roles in to something more. Hall also plays her character perfectly with confusion and vulnerability of someone being violated. Affleck though is the core of this film. He plays Doug like no other character Affleck has played before, maybe it is because he had such a great Director. Buckeye Brad gives The Town and A I loved the story the way the film was shoot, and the acting of everyone involved. This is also in my top Ten movies of the year! Go See it men and women both will enjoy it. Has the Action for the men, but also the love story for the women.